We’d love your help. Let us know what’s wrong with this preview of The Silence Between Us by Alison Gervais. Moving halfway across the country to Colorado right before senior year isn’t Maya’s idea of a good time. Leaving behind Pratt School for the Deaf where she’s been a student for years only to attend a hearing school is even worse. Maya has dreams of breaking into the medical field and is determined to get the grades and a college degree to match, and she’s never considered Moving halfway across the country to Colorado right before senior year isn’t Maya’s idea of a good time. Leaving behind Pratt School for the Deaf where she’s been a student for years only to attend a hearing school is even worse. Maya has dreams of breaking into the medical field and is determined to get the grades and a college degree to match, and she’s never considered being Deaf a disability. But her teachers and classmates at Engelmann High don’t seem to share her optimism. And then there’s Beau Watson, Engelmann’s student body president and overachiever. Maya suspects Beau’s got a hidden agenda when he starts learning ASL to converse with her, but she also can’t deny it’s nice to sign with someone amongst all the lip reading she has to do with her hearing teachers and classmates. Maya has always been told that Deaf/hearing relationships never work, and yet she can’t help but be drawn to Beau as they spend more and more time together. But as much Maya and Beau genuinely start to feel for one another, there are unmistakable differences in their worlds. When Maya passes up a chance to receive a cochlear implant, Beau doesn’t understand why Maya wouldn’t want to hear again. Maya is hurt Beau would want her to be anything but who she is—she’s always been proud to be Deaf, something Beau won’t ever be able to understand. Maya has to figure out whether bridging that gap between the Deaf and hearing worlds will be worth it, or if staying true to herself matters more. To ask other readers questions about The Silence Between Us, please sign up. My thanks to the author, publisher and NetGalley for an ARC of this book in exchange for an honest review. Maya Harris is 17 years old and was rendered deaf when a bout of meningitis left her profoundly deaf at the age of 13. Her mother's job relocation forces Maya to leave her special hearing impaired school and move to Colorado, to a regular high school. Maya's young brother is also afflicted with cystic fibrosis and her mother is a single parent, having to cope with two children with chronic h My thanks to the author, publisher and NetGalley for an ARC of this book in exchange for an honest review. Maya Harris is 17 years old and was rendered deaf when a bout of meningitis left her profoundly deaf at the age of 13. Her mother's job relocation forces Maya to leave her special hearing impaired school and move to Colorado, to a regular high school. Maya's young brother is also afflicted with cystic fibrosis and her mother is a single parent, having to cope with two children with chronic health situations on her own. Maya is understandably upset and nervous in her new environment, and she often felt lonely and ignored, but perhaps her prickly attitude might have been a bit to blame for that? (Just saying!) Poor Beau learned ASL (sign language) in order to communicate with her. At first, she greeted his attempts with disdain and tended to point out all of his mistakes. I have no idea why Beau persevered and eventually won both Maya's friendship and her affections. That was a hard sell for me, but once the romance between Maya and Beau gets off the ground, I started to like Maya a bit more. (Don't get me wrong: I don't mind a fierce or spunky heroine: in fact, I prefer them. What I don't like is someone being unnecessarily mean.) The story did occasionally get bogged down in unnecessary details about homework assignments, etc, but for the most part, this was a very interesting story about a young girl who is forced by circumstance to leave her sheltered hearing-impaired learning environment. She does learn to cope, and even comes to prefer the challenges of her new school..
Maya is less than thrilled to beginning senior year at a hearing school half way across the country. Deaf for four years, leaving her secure previous school, where everyone signed to one where she’ll be the only Deaf student and need an interpreter scares her. When Beau, a cute popular guy starts learning sign language, Maya is certain he’s either pitying or pranking her, unwilling to consider he may actually like her. Maya was a difficult character for me to like. While she had positive qualities like caring about her family and little brother with Cystic Fibrosis, she was mostly self centered and often unkind. THE SILENCE BETWEEN US is well written, distinguishing dialogue signed vs spoken. Aside from Maya, most of the other characters were likable. I had a hard time buying into a lot of the scenarios in the book. For example, I didn’t believe a mother would move her sick son from New Jersey to the high altitude of Colorado and be surprised his condition worsened. Surely his NJ doctor would have warned the mother to consider her son’s life and death situation, no matter how good the job offer. I also didn’t believe this mother would take a week long business trip and leave her Deaf seventeen-year-old daughter to care for her struggling seven-year-old son with no backup contingency plan. She was a great mother except when in regards to her son’s life threatening illness!?!?!? I also didn’t understand Maya’s insistence on not considering a cochlear implant. If she has been deaf all her life, I’d have understood more. She has a passion for becoming a pediatric respiratory therapist. Hearing would only seem to enhance the relationship with patients. After the scare with her brother, where he could have died, I’d think hearing would be a safety issue. Accommodations are great, important and necessary, but they also involve relying on others (in the case of the book) to provide those well-deserved services. I have a disability and sometimes have to rely on others to make my life. When my body won’t do what it’s supposed to do, I’m frustrated and would do anything to change the situation. I understand the Deaf community is rich and full. CIs are controversial and many have strong opinions against them. Maya had only been deaf for 4 years and so the majority of her experiences were hearing. I was glad she was proud to be Deaf and confident, but didn’t understand the safety and accommodations aspects of her choice. I enjoyed this book because I've never read anything like it before! I loved that this story is from the perspective of a female high school student who is deaf and confident with who she is as a person. The discussions characters had regarding cochlear implants were necessary and a delight to read. I loved that the conversations in sign remained in ASL syntax on the page! This novel only dipped its toe into the culture of the Deaf community; there's so much left to explore, and I can't wait for I enjoyed this book because I've never read anything like it before! I loved that this story is from the perspective of a female high school student who is deaf and confident with who she is as a person. The discussions characters had regarding cochlear implants were necessary and a delight to read. I loved that the conversations in sign remained in ASL syntax on the page! This novel only dipped its toe into the culture of the Deaf community; there's so much left to explore, and I can't wait for more representative literature. Also, when Beau compared Maya to Jane Eyre - *swoon*. Maya is a Deaf teenager who moves to Colorado before her senior year of high school. It's a big adjustment for her, as she's leaving behind her school for the Deaf to attend a hearing school. Gradually, Maya befriends classmates Nina and Beau who demonstrate interest in learning ASL to better communicate with her. With encouragement and support from her friends, her interpreter Kathleen, her single-parent mother, and her younger brother Connor who has cystic fibrosis, Maya navigates the world of the hearing and opens herself up to new experiences. Along the way, she untangles her growing feelings for Beau and battles staying true to herself even as she fears her community wants her to be someone different. The biggest strength of THE SILENCE BETWEEN US is its integration of ASL into the writing. I have read contemporary fiction that featured deaf MC's, but this is the first book I've read that I feel truly captures the essence of the language. ASL has its own rules of grammar and syntax that are different from that of English prose. It might take a chapter or two to get accustomed to reading ASL interwoven with fragments of conversation that Maya is able to lipread, but it's worth it for its uniqueness and the authenticity it lends to the novel. Another positive aspect of this book is that it was written by an #OwnVoices author. I'm glad that the book included an interview section at the end because I like to know the background behind the voice I'm reading in a story. The author is Hard of Hearing and works with the Deaf community, and this shows in the writing. It's hard to truly get inside the head of and create a character unless you've experienced his or her struggle in some form. I was glad to see the issues that face the Deaf community brought up by someone who is familiar with this subject. The characters in this book were fairly well-developed. I enjoyed Maya's friendship with Melissa (who is also Deaf), and I'm glad that Maya finally accepted Nina and Beau's wholehearted attempts to get to know her. Beau was a very sweet character and I thought his struggle with his college decisions and future was relatable for the YA demographic. I loved that he continued to learn ASL, despite making mistakes and being pushed away by Maya. However, without revealing too much, I thought how he incited a confrontation with Maya about cochlear implants was a bit out of character though this conflict is eventually resolved. The appeal of this novel is that is brings up topics of debate in the Deaf community, which makes it more than "just another YA contemporary." For the record, I believe that most acclaimed YA contemporaries have important insights into adolescence, a fragile period full of uncertainties and firsts that gives the genre its credibility and significance. But this book sheds light on subtle discrimination and the perception of deafness in the context of disability, which I think is important. I'm glad I read this novel. Although it's unlike anything I've read before, it's lacking a bit of that fluttery, jumping-off-a-cliff feeling (difficult put a finger on) that I've gotten from previous stand-out YA novels. But it's definitely worth a try for those who enjoy coming-of-age narratives and want to learn more about the Deaf community. A sincere thanks to NetGalley and Blink YA Books for providing an advanced reading copy of this book in exchange for an honest review. Thank you to Net Galley for providing a free copy of this book in exchange for an honest review. Finally. FINALLY. This is the first book I’ve read with a Deaf character that accurately portrays the experience of a Deaf student in a hearing high school. As a CODA and former teacher of the Deaf, I have worked with many students in both the residential and mainstream settings. Although there were times I wished Maya weren’t quite so angry, I quickly realized that her feelings were entirely honest a Thank you to Net Galley for providing a free copy of this book in exchange for an honest review. After moving halfway across the country, Maya found herself wary about going to a new school for senior year. Maya is not as worried about having to transfer to a new school as she is that the new school is a hearing school—which she hasn’t attended since becoming deaf a few years ago. Fighting discrimination, family issues, and her own self-doubt, Maya has a long year ahead of her. While I found it difficult and somewhat frustrating to miss out on a lot of the dialogue happening around Maya, this also seemed to be part of the point being made to help readers understand Maya and the deaf community. Gervais also did a brilliant job of incorporating conversation and dialogue into the book with the challenge of having a deaf main character. I enjoyed learning more about the deaf community and being aware of those around me as well as about determination and self-worth from Maya as I read her story. I'm almost done with my second semester of ASL, and I love and appreciate the language. So I was very excited to read this book, from the perspective of a deaf high schooler, and I perked up when I realized that the ASL would actually be written as ASL instead of just translated into English like in most the other books I've read with a deaf character. But the book left me wanting, in so many ways. Without even getting into my problems with how certain aspects of Deaf culture were displayed, the I'm almost done with my second semester of ASL, and I love and appreciate the language. So I was very excited to read this book, from the perspective of a deaf high schooler, and I perked up when I realized that the ASL would actually be written as ASL instead of just translated into English like in most the other books I've read with a deaf character. Without even getting into my problems with how certain aspects of Deaf culture were displayed, the characters were incredibly boring. I really don't know what the author was trying to do with the main character's personality. She was inconsistent. Maybe a stupid example, but Maya said at least 4 times, to the reader, "Why would I ever turn down food?" but we only ever saw her appreciate it one time, and it was cookies and her appreciation was simply her eating a lot of cookies. She was aghast when students were surprised that she could speak, and she made a HUGE deal about how deaf people are perfectly capable of speaking, but the author never once brought up that some deaf people CANNOT speak, or that they only choose to speak around certain people, or that deaf people who lost their hearing young, or were born deaf, have to go through intensive speech therapy to be able to speak well. It was such an illogical way for her to go about the situation, and, while I don't ask for characters to always make logical choices, I ask that, when it comes to representation of something so few people understand, they do. Look at that. I already failed at not getting into my issues with the deaf aspect. Sometimes I can get over characters' bland personalities if the romance is good and it brings out different aspects in the characters, but I have to say, this was quite possibly the most poorly written romance I have ever read. There was zero chemistry. ZERO chemistry. I honestly didn't pick up on the fact that the guy was the love interest until a few chapters in, and I was still skeptical. If you've read any number of romances, you know how obvious it usually is (and not in a bad way: if you can't tell, it means there's NO CHEMISTRY) (even platonic relationships have chemistry) but I thought that he was just going to be the nice friend who wanted to learn sign language because who reads past the first paragraph in a book summary. Not me, apparently. Way too much of the plot was focused specifically on Maya's struggles being deaf in a mainstream school, and maybe this would have been more interesting or dynamic to me if I had less knowledge on the subject, but I think just the way it was presented seemed whiny and melodramatic rather than helping the reader understand where deaf people are coming from. Again, I could not get on board with Maya's character. We also had two very common tropes: the kid whose dad wants them to go to medical school but the kid loves something else, and the kid who has a passion for a certain career, but they don't think they'll be able to get it. These are both still usable tropes, if done correctly, but these were tired situations. Also. We never learned how Beau was learning sign language? So. Before I get into the rest of my problems with the deaf representation, I am just an ASL 2 student. I am well aware that I don't fully understand Deaf culture or any other aspect of being deaf. But our main character didn't understand what it meant, either, and I just couldn't get past the bad depiction. It was weird to see Maya saying that she was part of the Deaf community (capital 'D' Deaf) when she had no connection to the community other than her one deaf friend she spoke to of FaceTime. She had just moved to a new town, but there was zero reference to deaf adults or other kids in her life. We also only saw 2 characters who liked being deaf, Maya and her friend. Partway through the book, Maya tries to go out and meet deaf kids, but they were actually a group of kids with Cochlear Implants, and none of them used sign. Not a single person at the event had any respect for ASL or deaf people, and it made every person with a CI seem like the bad guy. And it wasn't like it was just the main character's opinions--it was the way the other characters acted. When Maya had lost her hearing, her mother learned ASL along with her, and her younger brother learned a little. So when she went to the aforementioned CI group, she was surprised to find that the mother of one of the deaf kids didn't understand ASL. I understand that this book should not represent every deaf person, but this was coming directly from Maya's head. She was genuinely surprised--surprised--that the mom didn't know sign even though that type of situation (the family of a deaf kid not learning sign) is more common than it should be. If she was really part of the Deaf community, she would know this. I thought that this book was super cute and a good read, and please don't let what I'm about to say discourage you. I do have one real complaint about the book, and it's that the book kind of just seemed to end with some things left unresolved. There was a lot of buildup around Beau's mom and the scar on his leg, but when the backstory behind it was revealed, it was kind of pushed aside in favor of other things. Since there was so much buildup that I was kind of anticipating more than a page being spent on it, and it left me feeling a little unresolved. A good portion of the book also focused on Maya searching for a job because it seemed like her mom was struggling to pay her brother's healthcare bills. However this storyline was kind of dropped in the midst of the CI debate with Beau? There was some resolution to the storyline, but it still felt like it could have been elaborated on a bit more. I was also a little confused because the CI storyline with Beau appeared to be a major part of the story based off of the book description. However, it doesn't appear until near the end of the book, and not a lot of time is really spent on that plot thread compared to other aspects of the story. There's nothing wrong with that storyline kind of taking a backseat for most of the book, but it doesn't make sense considering how much weight this storyline was given in the book description. Definitely don't get me wrong--I really liked this book. The reason that the things mentioned above disappointed me so much is because I liked everything else about the book. I really love the main character Maya and how unafraid she is to be herself and call other people out on their missteps. I really love how this book looks at the difference between Maya's relationships with other Deaf people and her relationships with hearing people, and it really goes deep into Maya's feelings as she navigates a hearing school and prepares herself to go to a hearing college. I really liked her love interest Beau, and I only wish that we got to know him more. We did get to know him well, but as I mentioned earlier, I felt like there were some questions about him that were left unanswered or the answers we got felt like they could've gone deeper. Overall though, I thought Beau was a good love interest, and it was great to see him grow along with Maya throughout the book. He definitely made many mistakes, but the important thing is that he always apologized for those mistakes and took the initiative for himself to learn more about the Deaf community. Maya became deaf when she was 13 years old. For the past four years, she’s immersed herself into Deaf culture including going to the Pratt School for the Deaf. However, after her mom’s job transfers her to Colorado, Maya is faced with going to a public school–a hearing school. For the first time since becoming deaf, Maya finds herself heavily immersed in a predominantly hearing culture. As a result of this, she faces c Disclaimer: I received an eARC from Netgalley in exchange for an honest review. For the first time since becoming deaf, Maya finds herself heavily immersed in a predominantly hearing culture. As a result of this, she faces conflict over the removal of being heavily immersed into a thriving Deaf culture scene. On a first day of school, the school assigns Nina to show Maya around the school, and while Maya initially resists this, Nina and Maya become quick friends. As a result of this, Maya meets Beau, and suddenly, her rule about not dating hearing boys is questioned. While there’s a potential romance involved, this heavily deals with the cultural clash between hearing and Deaf because hearing people cannot truly understand the difficulties that those who are deaf (or Deaf) go through. Maya deals with this at school and at hospitals. The biggest conflict she has with this is the number of people who think she should have a cochlear implant–more on that shortly. This story very frequently renders ASL signs into text. Because the author is Hard of Hearing and works actively within the Deaf community, this is done with understanding that I do not have. From a hearing reader perspective, for what it’s worth, it was done very well, and I could easily keep track of when a conversation was being signed versus being spoken versus being lip-read. As a final note, as this book picks up steam (because I think this is going to be a very successful book), if you are a hearing reader, it’s extremely important to understand your place in the cochlear implant debate that happens within this story. Quite simply, it’s not your place to pick a side. Some hearing readers definitely won’t understand why there’s a debate, and for that, Alison Gervais does include information in the back of the book while there’s countless articles online about it as well. But as a reminder, Maya’s beliefs on this are her beliefs, and they’re valid beliefs. With that off my chest, I strongly encourage you to read this book. The Silence Between Us focuses on Maya's transition into a hearing school since her family moves and she is unable to attend a school for people with hearing impairments anymore. While at the hearing school, Maya builds relationships with friends and a boy named Beau, who takes up sign language in order to communicate with her. I have to say, I was really looking forward to reading this book but I had a hard time getting through it. 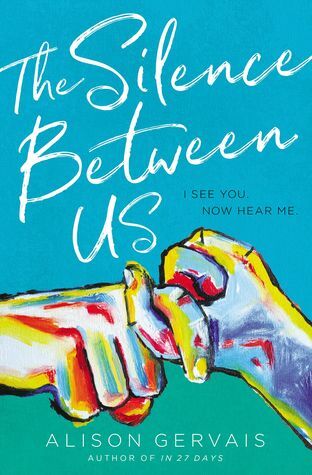 The story itself did not match up with the summary that was giv The Silence Between Us focuses on Maya's transition into a hearing school since her family moves and she is unable to attend a school for people with hearing impairments anymore. While at the hearing school, Maya builds relationships with friends and a boy named Beau, who takes up sign language in order to communicate with her. I have to say, I was really looking forward to reading this book but I had a hard time getting through it. The story itself did not match up with the summary that was given for it. I was reading this as an e-book on my kindle and if it wasn't for the page count on the copy, I'm not sure I would've even known when I hit the middle of the story. There wasn't really a climax, nothing big ever happened, she was worried about college and maybe a relationship with a hearing boy but even then there was little to no conflict. The conflict promised in the summary was only delivered at the very end of the novel and it was wrapped up and resolved far too quickly, it was as if it never happened. Throughout the novel, I kept waiting for something more to happen and it just didn't. I also struggled with the characters because, besides Maya, it felt as if every other character was incredibly underdeveloped. Maya hasn't been deaf her entire life, but she still has her struggles. So when her mother moves the family across the country, she starts her life over, in a hearing school. We follow Maya as she adjusts to her new life with her small family, learning to make friends and navigate her new world. This wasn't a bad read, but I did have a few issues with the book. I understand the mom had to move her kids for her job, but her son suffers from Cystic Fibrosis, and the climate in Colorado is awful fo Maya hasn't been deaf her entire life, but she still has her struggles. So when her mother moves the family across the country, she starts her life over, in a hearing school. We follow Maya as she adjusts to her new life with her small family, learning to make friends and navigate her new world. This wasn't a bad read, but I did have a few issues with the book. I understand the mom had to move her kids for her job, but her son suffers from Cystic Fibrosis, and the climate in Colorado is awful for that. Her son does nothing but suffer from the moment they get there. I can't imagine having to make the decision of supporting the family or supporting my son. As far as Maya's friendship with Beau and Nina, they were a bit one-sided, with her friends endlessly supporting and doing things for Maya, but her not reciprocating. I was also baffled by Jackson because Beau seems like a good guy, and he's friends with Jackson. Maya hated him and kept wondering why Beau would be friends with him. But Beau defended him without a reason as to why. I was given an ARC from NetGalley in exchange for my honest review. This YA story focuses on Maya, a deaf high school senior who just moved to a new school. It follows her struggles navigating a hearing school with the use of an interpreter and forming relationships with students who have little experience with deaf people. It was really interesting how the author wrote what was said in ASL as it would be said, and explained how it is "spoken". I enjoyed learning more about the deaf community an I was given an ARC from NetGalley in exchange for my honest review. This YA story focuses on Maya, a deaf high school senior who just moved to a new school. It follows her struggles navigating a hearing school with the use of an interpreter and forming relationships with students who have little experience with deaf people. It was really interesting how the author wrote what was said in ASL as it would be said, and explained how it is "spoken". I enjoyed learning more about the deaf community and some of the struggles Maya deals with. The plot was pretty good, I would say pretty typical for a YA high school story. I did feel like the synopsis made a lot more of one of the conflicts than it was in the story itself. Overall it's a good story that opened my eyes to a different point of view that I was unfamiliar with. It will be published in August, if you want to add it to your TBR pile! 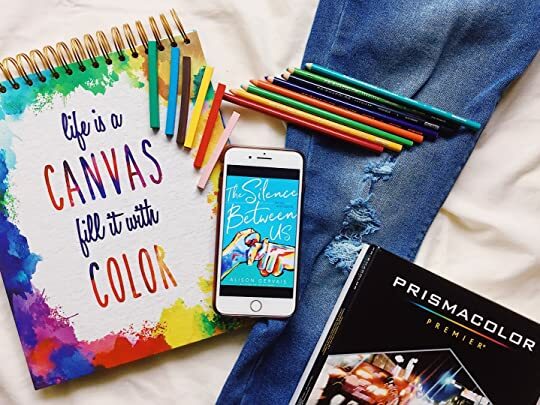 The Silence Between Us is a story of Maya who is moving from her home town of Jersey and moved into Colorado and not only it being her senior year; she also has to go to a hearing school. Being Deaf for Maya is just apart of her, and she never considers it a disability and now having to juggle the trials of getting ready for college and being the only deaf student at Engelmann High. Through many trials and struggles, Maya finds new friends and teaches the hearing world that Deaf/ and hard of hea The Silence Between Us is a story of Maya who is moving from her home town of Jersey and moved into Colorado and not only it being her senior year; she also has to go to a hearing school. Being Deaf for Maya is just apart of her, and she never considers it a disability and now having to juggle the trials of getting ready for college and being the only deaf student at Engelmann High. Through many trials and struggles, Maya finds new friends and teaches the hearing world that Deaf/ and hard of hearing people are just as capable as anyone else. Thank you to NetGalley for this ARC! Maya is a senior in highschool when she moves from New Jersey to Colorado. This is also her first time at a "hearing school", as she lost her hearing after a battle with meningitis. At her new school, she'll need an interpreter, and be the only deaf person there. When Beau, a cute, popular classmate starts to learn sign language to communicate with her, she is apprehensive, unsure if he is genuine or taking pity in her. With support from her mother, and younge Thank you to NetGalley for this ARC! With support from her mother, and younger brother with Cystic Fibrosis, her new friends Beau and Nina, Maya comes out of her shell and navigates the world of the hearing, and being open to new experiences. Maya struggles to be the only deaf girl in a hearing school while butting heads with smart and attractive Beau Watson. I enjoyed the story, however so much of it bothered me. I dislike the title. It might as well scream “ for John green fans” and “watch my cheesy zac efron movie in 6 months!” The characterization seriously sucked. The characters only existed so maya could be jealous of them or derisive. Maya experienced no personal growth. So what, she learned to have hearing friends? What of he Maya struggles to be the only deaf girl in a hearing school while butting heads with smart and attractive Beau Watson. The deaf people are rarely talked about. Maybe you passed one today and didn't know it. Some are born deaf, others become deaf overtime.Doesn't mean they aren't like us. Maya has just moved to a new school, where everyone ISN'T deaf. Cue the clueless cute guy. Why don't they just leave us alone when we have our ideas? The guy doesn't understand Maya at all, especially when she has the chance to hear. Isn't NOT hearing sometimes better? Less worrying about all the gossip and rumors. I received a copy of this book through NetGalley in exchange of an homest, unbiased review. I loved this book! I loved Maya and even though we have different challenges, I found her character to be authentic . The friendships she developed made for a great story: showing that people from different worlds can coexist. I love that the characters have outlets such as art, reading, etc. I feel like that's a good lesson in the story to mirror healthy coping mechanisms. There are parts that made me sa I received a copy of this book through NetGalley in exchange of an homest, unbiased review. I received a copy of THE SILENCE BETWEEN US on NetGalley in exchange for an honest review. Thank you to the publisher and author for the opportunity. This book should be required reading in school. Alison Gervais captivated my interest from the get-go. It has all the elements of a great YA story: family and friends drama, regrets, second chances, and a story shrouded in frustration and forgiveness. My father-in-law is hearing impaired, and each day Is filled with so man I received a copy of THE SILENCE BETWEEN US on NetGalley in exchange for an honest review. Thank you to the publisher and author for the opportunity. I'm sooo looking forward to this, i hope i won't be disappointed.